Two drafts are available—7 feet 3 inches and 5 feet 11 inches. The D/L is 200 calculated using the DWL at 37 feet 9 inches. The L/B is 3.1. I like the short bow overhang. If the boat were a racer designed to a box rule I can see a plumb bow. But this is a cruiser-racer and not designed to a box rule so why not give the bow some overhang to get the anchor away from the stem? Freeboard is high and sheerline almost dead straight. To my eye it’s a pleasant looking boat. I can’t even count the number of interior layout options. Think of it this way: There are three arrangements of the area aft of the companionway, five arrangements of the galley and main saloon area and three arrangements of the accommodations forward of the mast. It’s a good looking rig with the mast well forward and swept spreaders. I like the way the headstay is pulled aft off the stem about 14 inches. Sometimes you can use that detail to bury the jib furling gear below the deck and get the tack of the jib down to the deck. The Contest 42CS will make a great cruising boat, and I think with the wide variety of options available it can’t help but appeal to a lot of sailors. 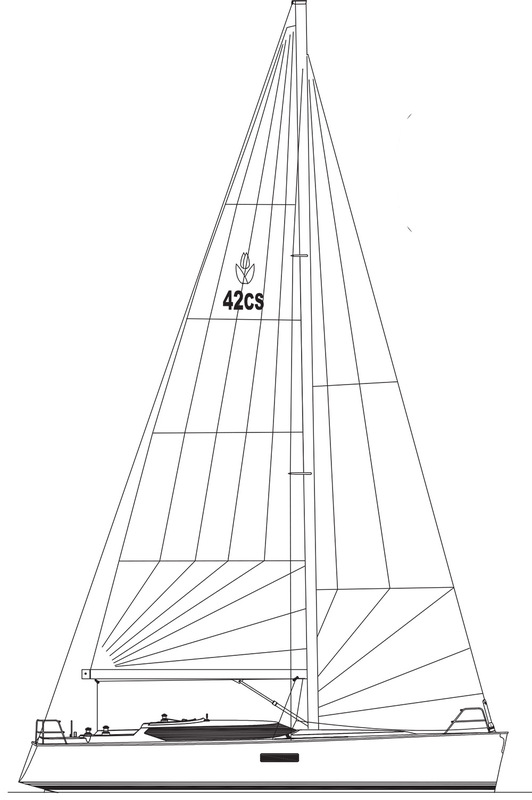 LOA 42’2”; LWL 37’9”; Beam 13’7”; Draft 7’2” (deep), 5’11”; Displ. 24,250 lbs. ; Ballast 10,150 lbs. ; Sail area 505 sq. ft.; SA/D 22.19; L/B 3.1; D/L 200; Auxiliary Yanmar 54-hp saildrive; Fuel 80 gal. ; Water 126 gal.